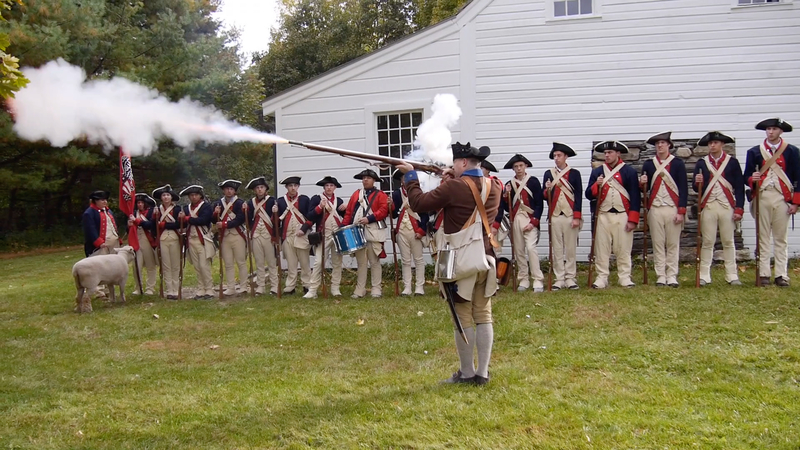 There was a touch of Revolutionary War and black powder smoke right in the middle of Pine Plains the other day as Neil Murray was giving his students of military history some experience of what it was like to be Continental Soldiers. I grabbed a scene with my cell phone and then, so impressed with the passion of the “lesson” that I rushed home and got my good camera. The following video stands on its own. Watch and enjoy! And, if you can, watch it full frame by clicking the little box on the lower right of the image. Kudos and thanks to the “cast” — the students and teacher of military history at Stissing Mountain High School! Lots more videos like this on Pine Plains Views. Check them out! grreat video ! took kids seriously – is the town training a group to recreate some of historic moments in town ?- with young people in it who as they grow others are trained – minor sturbridge ! I didnt know about that house located there? Thanks for the comment! I hope that the community will eventually have more involvement with its history, and it’s a good question. If you want to learn more about the house itself, here’s a whole story about it. There’s lots more stories about our local history. Thank you to the kind man for filming and posting this video. This truly shows a teacher that has a passion for teaching. A passion for teaching a subject that he enjoys. The hands on approach is what makes this class so extraordinary. I’m glad that our community supports education like this. My daughter is in this class, in this video. She looks forward to more of these field trip. Once again thanks Stan. The community is fortunate to have you and Sarah. Thanks, Scott. We’re all in this together!